To address issue number one — the lack of public awareness of the co-operative model — respondents suggested improving the co-op presence in the education system and raising awareness by taking more opportunities to publicize the co-op commitment to community in all its many manifestations. They also felt it was important to communicate the co-operative difference more clearly and more loudly in the highly competitive marketplace. And as came up many times, sharing success stories was felt to be an easily accessible promotional tool that was too often overlooked. Respondents had a number of recommendations to improve the competitiveness and success of co-op enterprises, the second top theme. Leaders should make better use of the co-operative identity to gain market advantage; emphasizing co-op cost efficiency as compared to multinational firms would be a strong start. Co-op officials should also lobby governments for a more positive policy environment, and they should be more proactive in responding to the ever-changing economic and political milieu. The co-operative difference, ranked third in the survey, was a common theme throughout the comments on almost every issue and was seen as a significant competitive advantage that could be used much more effectively, and not simply in the marketplace. Co-op leaders could use it as a tool to re-engage the often-indifferent membership by making them more aware of the distinctive nature of co-operatives; emphasizing the economic benefits would be a practical way to begin. They could further differentiate their organizations by making a conscious effort to stay true to the co-op mission and broadcasting it to members, employees, and the public. And, once again, respondents felt that compelling, results-oriented success stories would find a welcome audience. Youth engagement, which ranked fourth this year, is a perennial issue that comes up in discussions on the future of co-operatives. Respondents had a number of suggestions that could increase youth involvement. Cultivating more of a digital presence would be a strong start, as would getting more co-op content into the school system, which has thus far proven to be a major challenge. One person suggested rebranding the co-op principles so they would be more appealing to youth. Respondents also observed that a better case needs to be made for the relevance of co-operatives to younger generations. Our intention in sharing these results is to provide a snapshot of issues and comments that will be both of interest and use to practitioners across the country. Further analysis of the results is underway. Watch this space for more details! 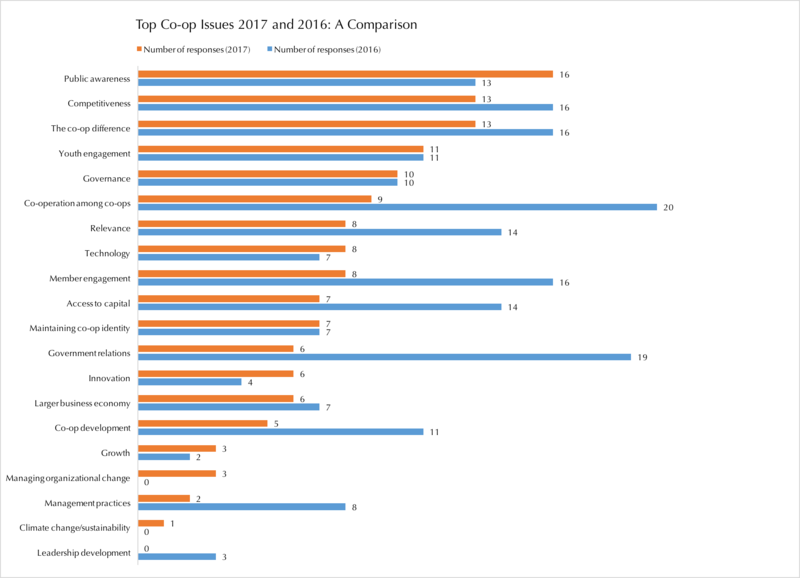 You can find more information about Top Co-op Issues 2017 here. This entry was posted in Governance and tagged co-op difference, co-op mission, co-op principles, co-operation among co-ops, commitment to community, competitive advantage, competitiveness, governance, member engagement, policy environment, public awareness, relevance, youth engagement by Nora Russell. Bookmark the permalink.